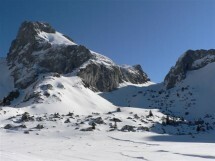 I organize a winter hike to Le col des Portes d'Oche from Bernex (50 km from Geneva) on Sunday March 6. We will drive over Thonon to the small ski station Bernex. We will go through some forest and then over alpages (mountain meadows) to the Chalets d'Oche and then gradually make our way up to the Portes d'Oche (1937m), with views over the Chateau d'Oche mountains and several other tops. A gradient of 750 m and a distance of 11 km. Walking time: about 5 hours.